This course will not on its own allow you to become an instructor. You will also need to attend our Instructor courses with our sister company, ITG Instructor Training Ltd and you can visit our instructor training site here. If you are already an instructor and wish to join us then contact us for more information on 01206 5805359. 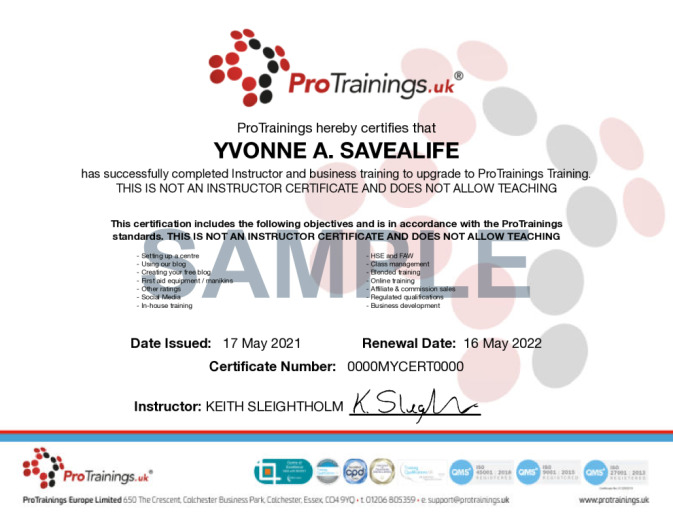 The instructor rating is subject to approval and a complete centre application. This online course is free to instructors attending a ProTrainings or ITG instructor course to prepare you for your training. To set up a ProTrainings centre, the cost is £250 plus VAT, which will then credit your account with £175 plus VAT in certificate credit. Therefore, you do not pay the first £175 plus VAT of certificates. With this course, we cover the business side as well as working as a ProTrainings instructor and skill evaluator. If unsure please contact us first. If you need the Award in Education and Training course that has replaced the old PTLLS qualification, you can contact our sister company ITG and train for Education award AET Qualification as a blended or classroom course. This course comes with 6.0 hours of CPD, although the time to complete the course online may be less than this. Total course time includes 2 hours and 5 minutes of video training as well as knowledge reviews, final test, remedial help and reviewing downloaded material.